NorthPark Community Church has multiple ways for adults to connect, journey through life, study the Bible, and grow in relationship with Jesus. We welcome you to explore and check out the adult community opportunities we have to offer! The mission of Men's Ministry is simple - create authentic points of connection for the men of Northpark so we can share in community our challenges and triumphs of our faith and daily life. We love to have fun! But in all our activities and get togethers we aim keep Christ at the center and our focus. May he be glorified through our relationships with other men. Women’s ministries is vibrant and alive at NorthPark Community Church. We offer a rich variety of experiences with ladies who invite you to love, live, serve, and give like Jesus! There are events, groups, and activities for women in all stages and seasons of life. We encourage all women of all ages to join us! The mission of Women’s Ministry is to bring women together to deepen our personal relationship with Christ as we connect with one another, utilizing our gifts to advance His kingdom. If you are interested in being involved with women’s ministry, have questions or concerns, please feel free to reach out to any of the ladies on the council. 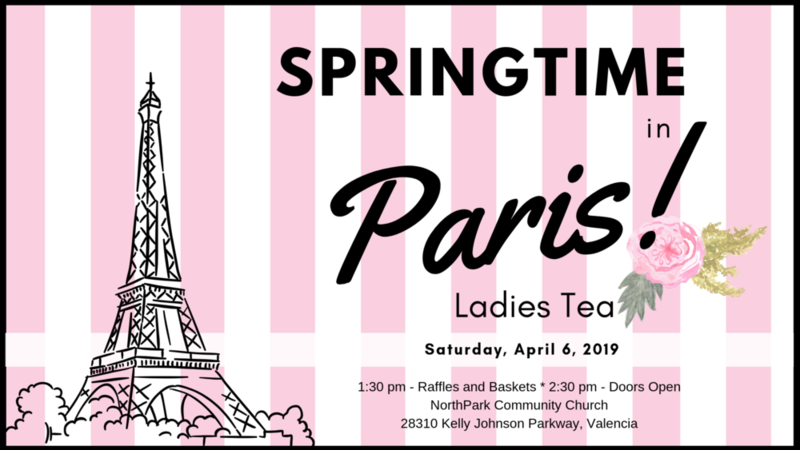 Join the women of NorthPark as we enjoy our Springtime in Paris Ladies Tea on Saturday, April 6th. Gift Basket Donations- A popular aspect of the tea is our gift basket raffle. It is a fabulous part of our event and a portion of the proceeds will go to a community service organization. We are requesting YOUR help in the form of goods and services to be donated so that we can make many beautiful baskets. We are in need of either items or services to be donated, gift cards or empty baskets. If you are interested please contact either Karen Matson (karenm@bangprinting.com) or Shannon Smith (troynshannon@aol.com). If you have questions or are unsure how to help, please stop by the Women's Ministry table downstairs on Sunday mornings and we will give you ideas and suggestions. We encourage all adults to get plugged into a small group at NorthPark Community Church! God created us to experience life together. Life is better when it is shared in community. In Christ, we can journey together through life’s highs and lows! Small Groups are one way to get connected with others beyond Sunday mornings and really live life together! Preferred Evenings: (please check two, we will try to accommodate your request as best as possible). We will try to bring groups together by neighborhoods and preferred days. Thank you all and God Bless!